Bulletstorm is a pseudo-post-apocalyptic sci-fi FPS, released in North America in February 2011. Published by Electronic Arts, the game was developed by Epic Games, of the very successful Gears of War series, and People Can Fly. You may remember them from their first game, Painkiller. Those influences are readily apparent in the game. Bulletstorm stars a handful of chunky space marines stomping through alien landscapes, with gameplay featuring whimsical ultra-violence reminiscent of Painkillers Stake Launcher. Bulletstorm was fairly well-received by critics, garnering scores in the mid-80% range on Metacritic. 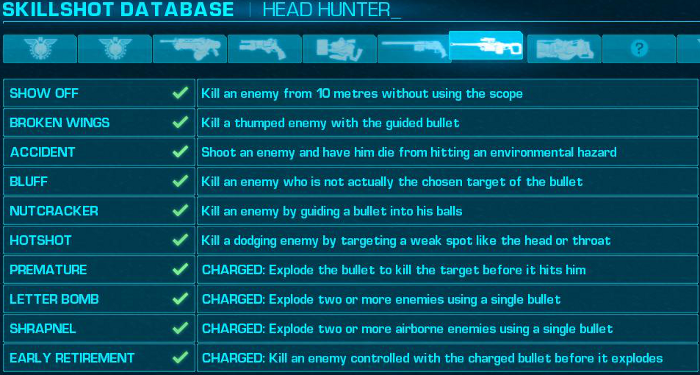 Reviewers praised the tight control, and the unique skillshot system that rewards players for killing enemies in creative and often brutal ways. By far, the most polarizing part of the game is the abundance of profanity. Some derided it as puerile, others said it was a goddamn scourge of mankind apt to turn our children into godless commie punkers. The usual fare. For my part, I love this game. It looks nice, and the admittedly drab plot is unobtrusive between fast-paced and simply fun combat sections. This is a straight run through the game. This won't be a 100% run, as there's no real entertainment to be gained from the collectibles. 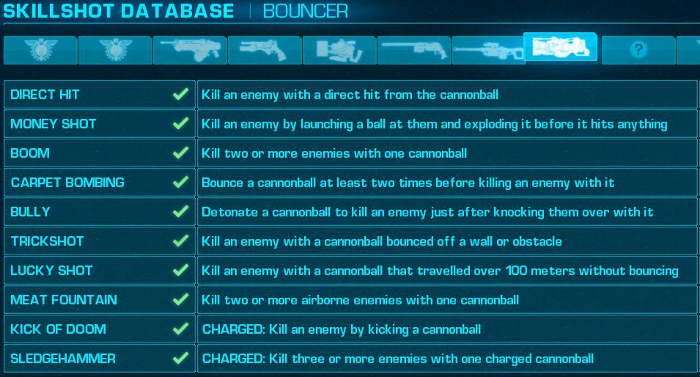 I will, however, show off every skillshot at least once by the end of this crazy thing. Spoilers don't really apply here - the story isn't that interesting or deep, and serves only to explain how you got from one corpse pile to the next. As usual, if there are complaints, I'll ask that you please be respectful and refrain from ruining the enjoyment of others. 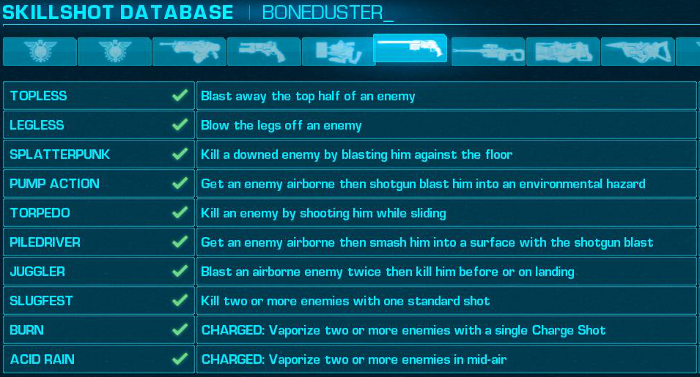 Bulletstorm is a straight shot through a bunch of baddies, so there aren't really any branching paths. But, since the game is foulmouthed enough on its own, I'm going to refrain from using any curse words in my commentary. If I forget myself and swear, it's on you guys to decide what I must do to clear my karmic debt. I won't cheat and do a ninja edit if (when) I slip up. My penance will be decided by popular vote in the thread. Bulletstorm rewards players for destroying enemies in creative and terrifying ways. They add a level of whimsy to the combat - rather than Gears of War-style "Get cover and spray bullets until everything stops twitching", Bulletstorm treats combat like a game of drunk golf. "Hey, think I can bank this shot off the clubhouse and hit that powerline?" It does a great job of keeping combat from getting routine - you're always looking around for interesting things to kick guys into. 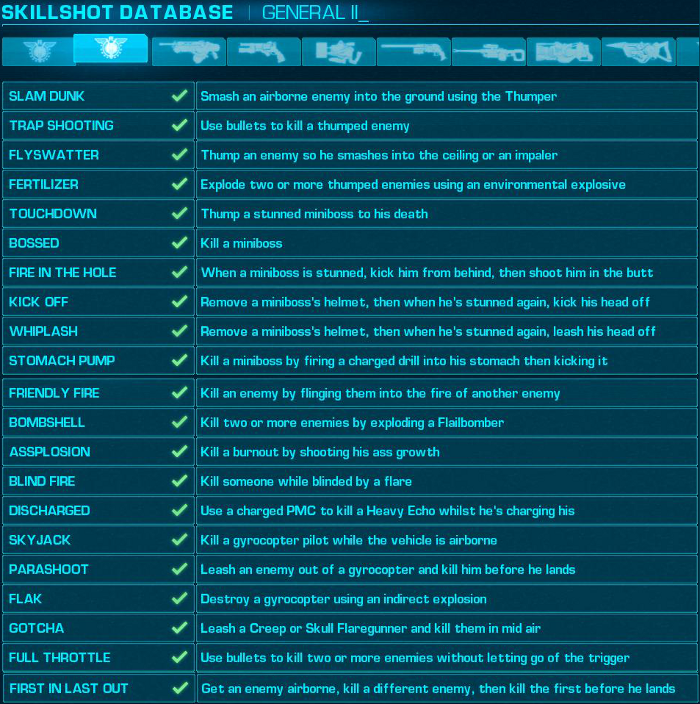 This image shows all of the skillshots we've unlocked as of the latest update. 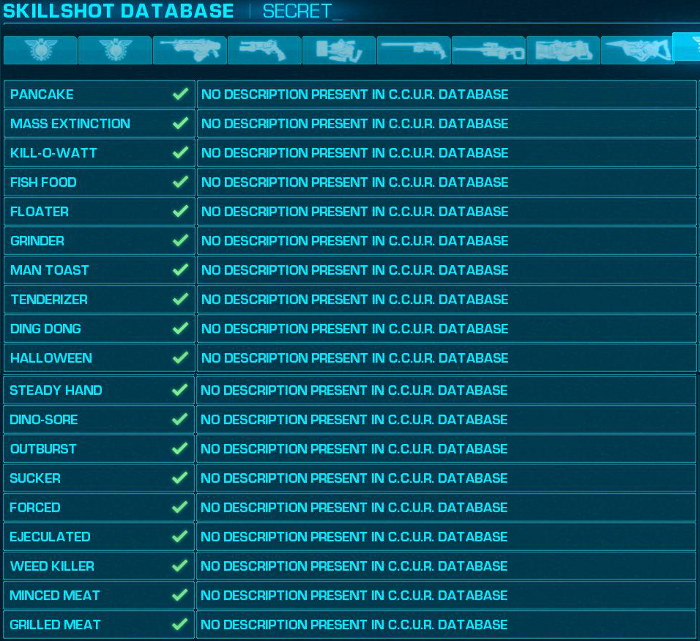 Which means, as of the end of the game we've managed to show of all of the skillshots at least once. Yay me! 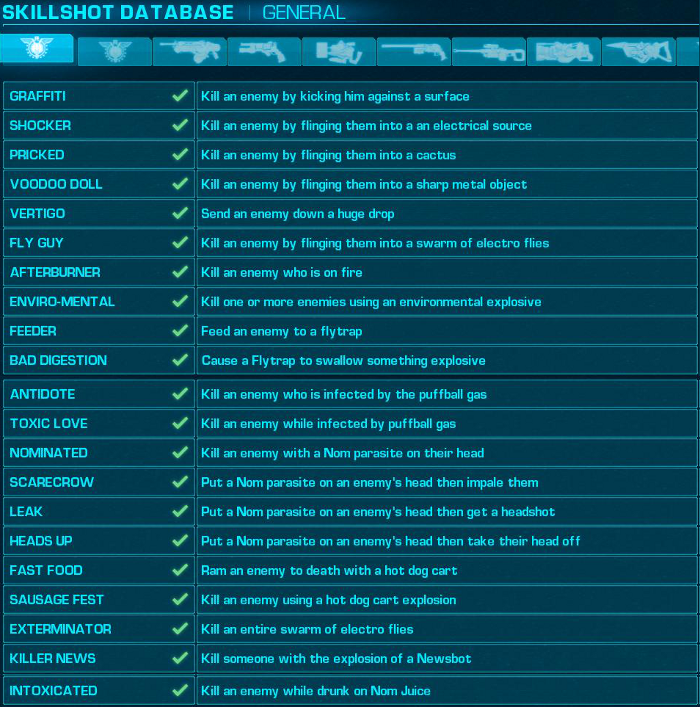 General Skillshots are your catch-all category. Some of them, like Pricked require a specific environmental hazard. 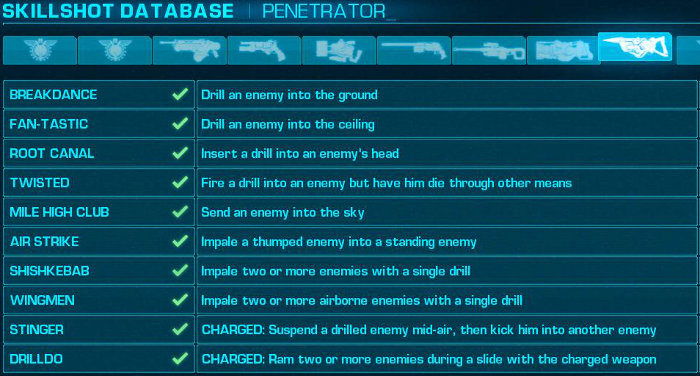 You're rewarded for keeping your eyes open - why drill half a clip of Peacemaker ammo into a guy's crotch when you can DAS BOOT him into some rebar? 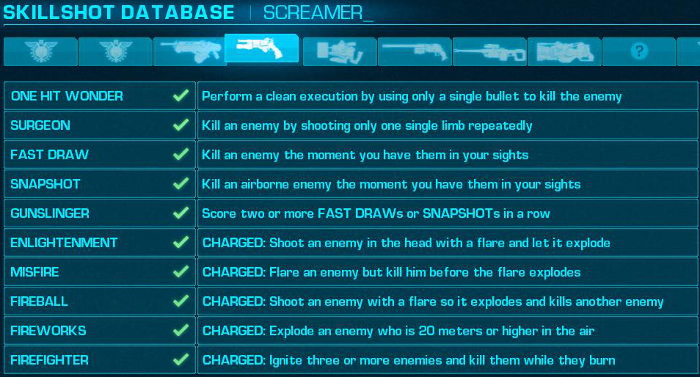 Others require a specific enemy type, such as Bossed. Still others reward you for... not being boring. Secret Skillshots are really neat. Opportunities to earn these occur in specific areas in the game. Some you'll earn as a matter of course, some require a bit of foreknowledge, observation, and/or luck. 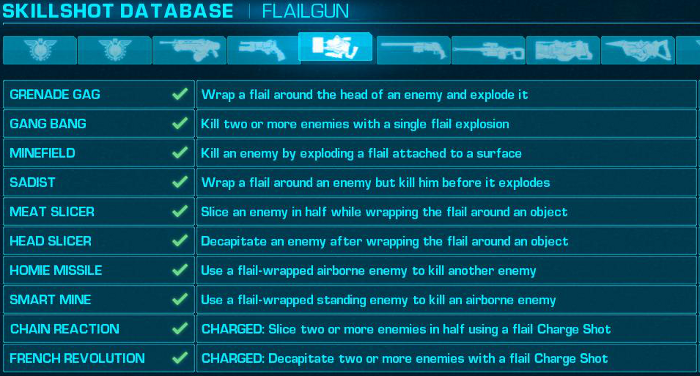 Weapon Skillshots require a certain weapon to unlock and earn. Not only do they add an optional level of challenge to combat, but they serve as a tutorial, hinting at all the neat and sometimes unorthodox things you can do beyond PULL TRIGGER MAKE BAD MAN FALL DOWN. 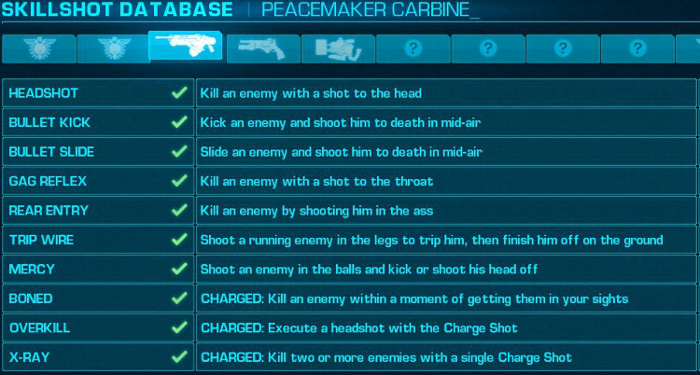 The Peacemaker is pretty basic - not a lot we can do with it at this point. Some of the later weapons give us an opportunity to play around.